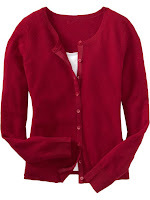 As I was making my weekly visit to oldnavy.com today, I was shocked to see them selling a line of cashmere sweaters. Yes, that's right. Old Navy is now offering cashmere. At first, I thought that was pretty cool. That is, until I saw the price! $69.50 folks! That's what thy are charging! My question is why in the world is Old Navy selling cashmere? And do they really think that Old Navy customers are going to pay Banana Republic prices for a sweater? That's craziness if you ask me.